Take a break and have some fun this Friday or Saturday with a 175% bonus and 50 Stardust free spins at SlotoCash Casino! 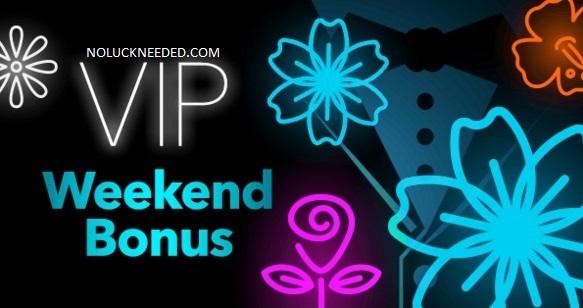 Redeem the coupon code SPRINGWKND to claim your 175% match bonus with 50 added Stardust free spins on Friday or Saturday if your account qualifies. While you are at it, Friday and Saturday depositors can play Aladdin's Wishes with the 100 free spins loyalty coupon 100WKNDWISHES. Good luck! No max cashout. $35 minimum deposit. 30x wagering on slots. Can be redeemed once per day on Fridays or Saturdays. Make your deposit Friday or Saturday to qualify for the 100 free spins! Do not claim 2 free bonuses in a row. Standard bonus terms apply including a maximum cashout rule and wagering requirements. 40x wagering, $500 maximum cashout. Max bet rule applies. Listed in message center on 5 April 2019; Expiration time unknown, "expires Saturday". Claim Your Stardust Free Spins and 175% Bonus at SlotoCash Casino! Last day for this 175% Bonus!